Balance Piston Din First Stage "For Pony / Stage Bottles!" "Nitrox Ready!" Need a drysuit inflation system add this first stage and build a less expensive system! This a 300 bar din fitting so it works on both a 300 or 200 bar valve! You will not find a better valve for a quality first stage as this one! 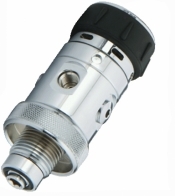 Don't forget to get the fill adapter below with our delrin cap at a special savings! This part is NITROX READY right out of the packaging!